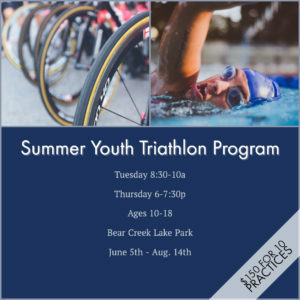 The 2018 Youth Summer Triathlon Program is kicking off on Tuesday, June 5th! 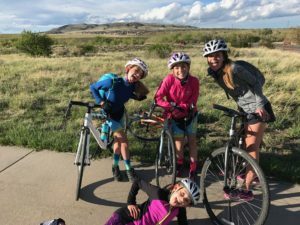 We’re excited to bring a Youth Triathlon Program to the Front Range of Colorado. Lead by Coach Katie Whidden and Coach Laura Bruck, the program provides a fun environment for athletes to sharpen skills in all three disciplines. Gaining confidence and having fun is what we’re all about! The Peak Performance Summer Youth Triathlon program is designed for first-timers or athletes with prior experience. Our goal is to give young athletes exposure to the sport and build basic skills as they advance in the sport. 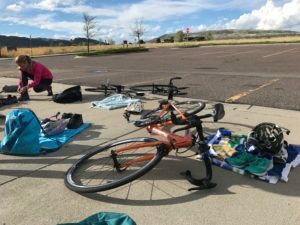 We hold practice two times a week and during most practices we will do a brick moving from swim to bike, swim to run, or bike to run. Each 90 minute practice is designed to give athletes a low pressure, fun, and positive environment to learn the sport and work at their pace. We have 3 race options throughout the summer. These will be great opportunities for athletes to test their fitness and sharpen their skills. If your athlete can’t attend these events there are other local races we can suggest.